Perhaps it is just the paper lover in me, but I feel there's something really spectacular and intriguing about getting a pretty envelope in the mail. It's colorful, it's different, it's certainly not a bill, and it's communication that didn't come in the form of an email! What's not to love, and who wouldn't be excited to see what's inside? With this thought in mind, I created the lovely little note card envelopes* you see here. 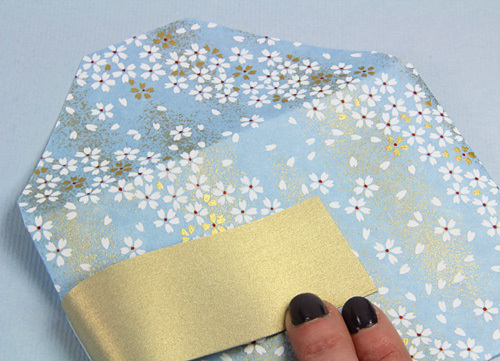 They’re made with two lightweight papers – in this case, a silk screened Japanese Chiyogami and a metallic, and unlike other patterned envelopes, these guys can be addressed and mailed. A portion of the solid liner wraps around to the front of the envelope creating a defined space in which to write the name and address. The writing will not get lost in a sea of pattern, and the unique band looks much nicer than a plain old stick-on label. 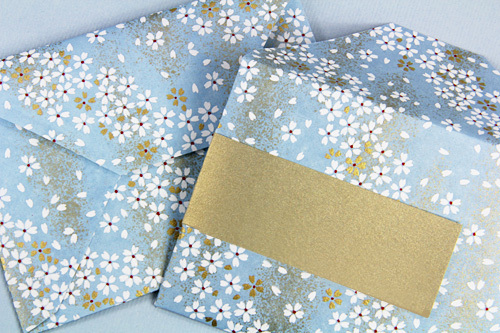 You can make these envelopes in any size with any two lightweight papers, and in the tutorial below, you'll find a template and instructions that show you just how to do it! 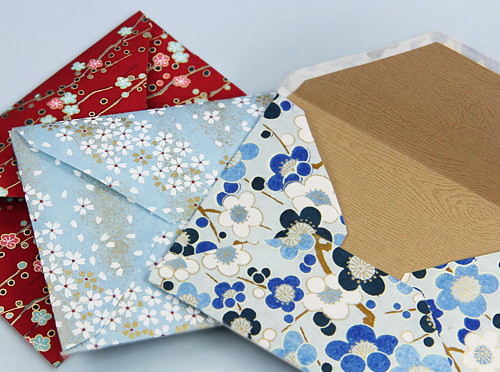 Begin by downloading the two envelope templates below - one for the patterned outside of the envelope, one for the lining and band on the inside of the envelope. 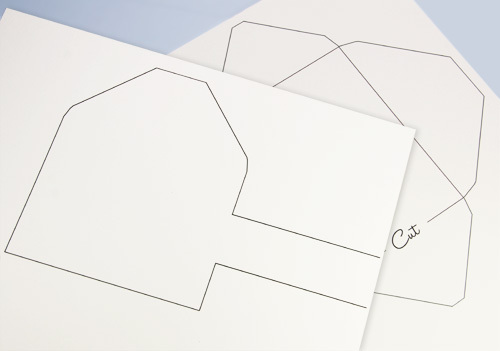 Print onto two pieces of card stock to create sturdy, durable templates. 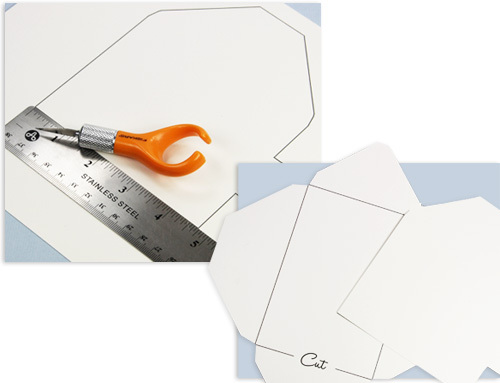 Next, cut out the templates using your cutting tool of choice. For straight, accurate cuts, an Exacto knife and straight edge seem to do the trick. 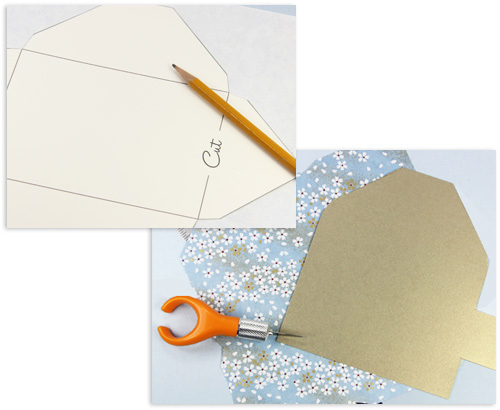 Use the templates to create the two pieces of your envelopes. Use Outer-Template-Pattern pdf for the paper that will become the outer portion of your envelope. 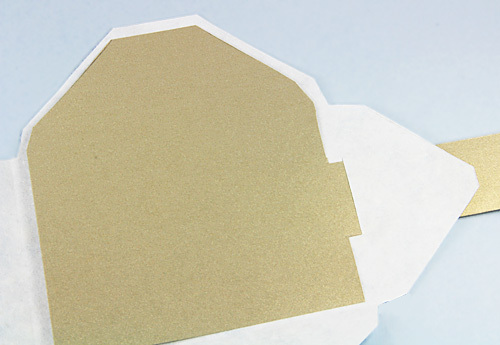 Use Inner-Template-Solid-Liner pdf for the paper that will become the liner and band of your envelope. Depending on your comfort level, you can either trace the template onto papers, then cut using an Exacto, or use the template to cut exactly from the papers. Don't forget to cut a slit in the outside paper for the band as indicated on the template! After creating the two pieces of your envelope, align them roughly as shown here, guiding the band through the slit in the outside layer. Using the template or the natural shape of the envelope as a guideline, fold the bottom, left, and right flaps in toward the center of the envelope. With the glue or tape of your choice, adhere the left and right flaps to the bottom flap using just enough to cover the areas of overlap. Be sure not to glue the envelope to the liner! 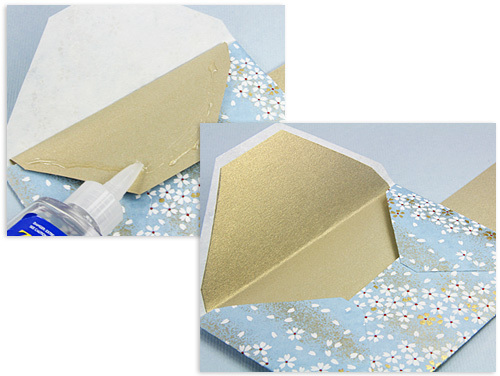 The final step, bring the band around to the front of the envelope, press so it is flat and straight, and glue. Once dry, this band can be handwritten with a formal or informal address or perhaps a personalized message. 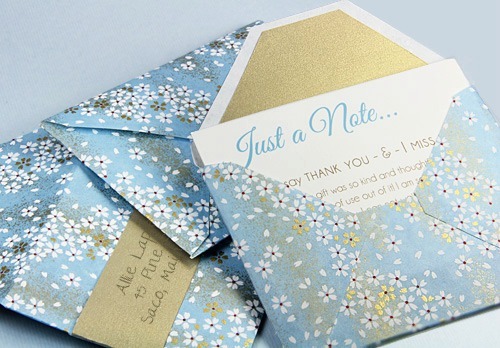 Founded in 1995, Marlborough, Massachusetts-based LCI Paper, Inc. offers consumers a quick, affordable way to purchase wedding envelopes, invitations & stationery for printing. Through an easy online ordering system, products are shipped same day from their order fulfillment center. LCI is Better Business Bureau certified and A+ rated. What an useful tutorial!. 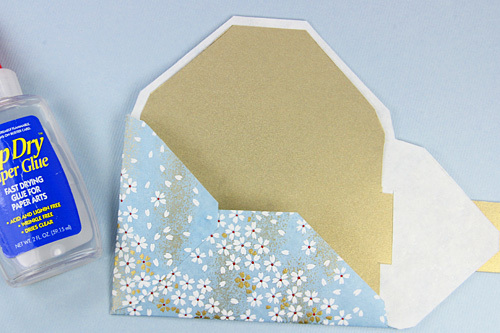 I always have trouble making envelopes and this double layered envelope is sure to be sturdy. Thanks for sharing. I hope my mom's not reading this because I think she might get one of these in a couple of weeks. very nice, thanks for sharing !!!! thanks for the template and the tutorial!! would give it a try, I love the papers used!! how beautiful, I will definately make some of these. The wrap-around is a very unique bonus; well done Ann! Great tutorial . It makes sense. Too many seem to skip a step or two. Also, yes bills don't come in envelopes like these!! Such a sweet project! Love the Japanese-print paper and that clever touch of the extended band for writing the address. Wow! These are beautiful, Ann! Thank you for sharing how you created them and generously offering the templates for free! Hi Ann, so wonderful to have you on craft schooling Sunday, love the envelopes! Thanks Sara, I'm glad you like them; me too!